Much like the undercounter model, the built-in washbasins fuse with the vanity unit or console to create a symphony of perfect harmony. 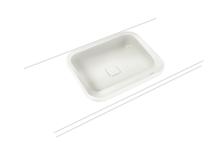 Rather than mounted under a top, built-in washbasins are designed with a low lip for virtually flush surface mounting. With their surround remaining visible, they betray a likeness with their matching KALDEWEI bathtub.